Angel was suppose to be BJ’s mate but ah hmm she turned out to be a he. A handsome set of fellows! My Dad and step-mom have had a parakeet for years; they didn’t know Nikki was a she until she laid an egg a few years after they had her. What kind of birds are they, and how long are they expected to live? 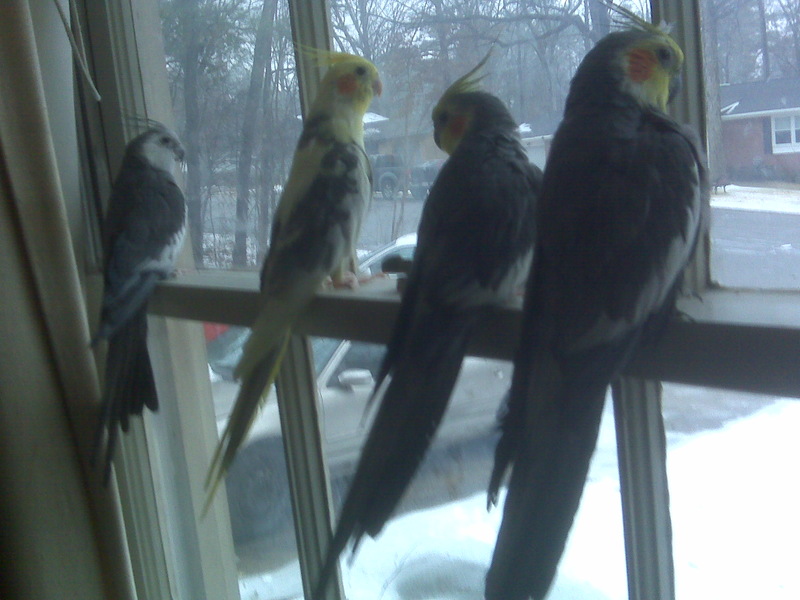 The boys are cockatiels and their life span ranges from 15 to 20 years. I am not sure how old Twopiece is but I know he is at least 14. BJ is 13 years old. Angel is 12 years old while Nye is 11. I know they are getting up in the years but try not to dwell on that. I loved your definition for the word clue. That made me laugh out loud. I just rescued two parakeets about 3-4 months ago. I also have Jasper, my yellow cheek Amazon parrot. Rounding up the gang are Sylar and Kashi, our two hamsters. Oh I almost forgot Flash my finch. I live in a strange house for the pets seem to live longer their life span. All of my finches have lived at least 5 years beyond. The hamsters are already a year over their life span. I have had more but I have reduced over the years. Thank you for the compliment, especially since I am so bias toward them. We have three dogs: a 10 year old Australian Shepherd mix, a 5 (I think) year old Basset Hound/Husky Mix and a 2 1/2 year old Lab/Great Dane (we think) mix. Descriptions and pictures of all of them are on my blog on the “About Me” page when you get your computer back. Oh my gosh, that is awesome. Once I get my laptop back, my own computer hehe will definitely check that out. Will have to tell my best friend about them – her name’s Brigitte!